It is with tremendous sadness that PHD announce the death of our founder, Peter Hutchinson, who passed away on Friday 2nd November 2018, aged 81. When you first meet Peter Hutchinson, and shake his hand, it's strange to think of what these hands have made and where those things have been. Pete has, for the last 30 years, been one of the world's leading experts in specialised expedition clothing. When I ask him about his first big expedition contracts, he describes making gear for Don Whillans for the South Face of Annapurna in 1970 and then the big expeditions to the South West face of Everest 1972 and 75; suddenly I realise that all those ground-breaking climbs of the 70's by people like Boardman, Tasker, Scott, Haston and Bonington were achieved in some small way by these hands. Then he talks about making stuff for Andy Cave and Brendan Murphy on Changabang I try and fill in the time gap between - Mear, Hall, Rouse and Carrington but before I've finished he's moved on to the Avengers! "Yes they wanted some down jackets for the stars to wear in between takes. I've done it before of course - for people like Madonna and Tom Cruise - and did I tell you about the sleeping bag I made that could fit seventeen people?" Now my head was starting to spin. "Pete is full of praise for Don Whillans as a gear designer, 'a bright bloke', they designed the first down suit together." Pete's better known as the man who started Mountain Equipment in the 70's a company that was the result of a growing demand for his bespoke down clothing. "It was just like a treadmill" he says, "I was forced to get on it by the demand and before I knew what was happening it was out of control. I didn't really want to be involved in a huge company but it just grew and grew, and I was left running just to keep up. I never really wanted it to get so big - all I wanted to do was make things - but all off a sudden you're a business man - it all becomes so remote." 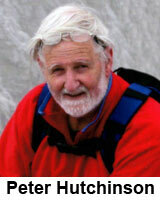 Pete started making sleeping bags and duvets while running a climbing shop, "The Mountaineer" with Pete Crew in 1960. The shop was based in an old brothel in Manchester, but business wasn't good, mainly due to the fact that there weren't that many climbers around and all those that were around were mates. "Yes it was discount that killed off the shop. Every one who came in we knew, so we never made any profit." So with time on his hands Pete started making equipment in the back room of the shop. Pete had a flair for it, and when they decided to call it a day and close the shop he decided to stick with the gear making, moving into a shed on a farm near Hyde. "It wasn't glamorous, I'd clean out cattle sheds every morning to pay for my rent and food, then go back to the shed and make a sleeping bag." Visiting climbers came and went with seven people sometimes dossing in the tiny shack. Pete remembers Martin Boysen making his mark, leaving his jam sandwiches on the floor, "I'd always get out of bed and step on them." One of Pete's greatest strengths has always been his close relationship and willingness to listen to the best climbers of the day. In the 60's he forged strong links with people like Don Whillans and Doug Scott and then latter with others like Brian Hall, Rab Carrington and the Burgess Twins. Today he's often on the phone talking about technical details with Andy Parkin or Andy Cave, carrying on valuable connection that has always kept his designs state of the art and practical. "I was always interested in making gear that worked and was lucky to find climbers with a analytical approach to gear." Pete is full of praise for Don Whillans as a gear designer, "a bright bloke", they designed the first down suit together along with expedition wind suits and other pieces of equipment that would become bench mark gear for high altitude. Pete wasn't confined to down equipment at this time, leading to one of his favourite story's. With his apprentice, a young Demy Moorhouse (who would later take the skills he learned with Pete and set up Clog and then DMM), Pete began making the first Cromolly pegs in Europe. His manufacturing efforts soon aroused interest in quite a few quarters including with the legendary American Yvon Chouinard who was starting out building what would be the most successful climbing company in the world. "Some companies won't do "a special" unless you talking a hundred units, that's not in my game plan." "Chouinard heard about this guy making Cromolly pegs in the UK and flew over, scared that I was a competitor. When he turned up at this ram shackled farm with two dirty guys heating up pegs in the fireplace and drying down in the oven I think he realised he didn't have much to worry about." Some time before this a new company in California gave Pete a ring and asked if he wanted to go work for them making down equipment. "I was really excited - the Nose and Salathe had just been climbed - it was the golden age of climbing". But it was not to be. Financial problems meant they pulled out at the last minute and Pete stayed in his shack. "I still wonder what would have happened if I'd have gone" muses Pete. The company's name was The North Face. But business was on the up, and Pete started employing people to help him fulfil orders. "The shops started asking to sell the gear commercially, so I found a proper factory - employed more people and formed Mountain Equipment. Looking back on it it was a questionable move". Growth was a whopping 60% a year, but as the company grew rapidly, Pete found it harder and harder to keep in touch. "The expedition and bespoke gear slipped away slowly, and I found myself with ninety employees, many of whose names I didn't even know." Like many of the grass roots manufactures, such as Rab and Buffalo, Pete felt that this wasn't what he really wanted. He'd started because he wanted to have a life based around climbing, but increasingly he was turning into a business man. "Instead of listening to climbers I had designers telling me about next year's colours," and he laughs when his attributes some of his competitors' successes to this very fact. But this was a time of innovation. Pete, along with Berghaus was one of the first people to use Goretex, which many forget was a huge leap in comfort and performance. Then in 1984 Pete made his second dodgy move. Under pressure to expand he was forced to get investors in. "It was like getting off my moped and getting into the back of a limousine - the company was now bigger but I felt I was losing control." And so Mountain Equipment slipped further and further from what it was good at, and as Pete's share holding slowly diminished, so did his interest. "I slowly stepped back, I was sick of talking to the bank." Then in 1991 Pete returned from holiday to find Mountain Equipment was under receivership. "I felt fatalistic about it, the decision had little to do with me." The company was sold and Pete finally had his chance to make his escape and go climbing - but he didn't. "Peter soon aroused interest with the legendary American Yvon Chouinard who was starting out building Patagonia." "I could see that the world was changing. Nearly everything you buy in a climbing shop is made abroad, which isn't necessarily a bad thing, but there's no flexibility. I saw that there was increasing room for the specialist, and what's more, I saw that I could start again from scratch and avoid making those same mistakes again." And so over the past few years Pete's set up again in a old mill not that far from his old farm shack, employing the highly-skilled machinists made redundant by the big outdoor companies as production moves to Asia. "I know every one now, I design the stuff, help cut out the patterns and deal with enquiries. If someone rings up and wants a special sleeping bag, or a down suit made to measure that's what I'm there for. Some companies won't do "a special" unless you talking a hundred units, that's not in my game plan - I'm back on my moped." The company's new label was 8000 Metres - and Pete retained some links with Mountain equipment, but he's now reverted to a simpler label - PHD (Pete Hutchinson Designs) as this represents a broader scope, flexibility and independence. "I'm interested in making the lightest and the best gear not only for the Himalayas but also Alpinists, Fell runners anyone who needs it really." He tells me that he's got a lot of new ideas up his sleeve, and already word is out about his Minimus sleeping bag, the warmest sleeping bag for it's weight yet made (495g) and his range of Super Alpine sleeping bags and Jackets that feature a water resistant inner as well as outer. The future seams bright and I find it refreshing how positive Pete is about what others would call his main rival - Rab. "I've known Rab for years, he makes great gear, and he's just like me 15 years ago - he cares about what he makes - and that shows. The difference is he's on the tread mill and I'm not anymore. Anyway I've got a few blackmail stories up my sleeve on Rab if he gets out of hand!" laughs Pete. Finally I ask him how he'll avoid making the same mistakes again and he tells me how he intends PHD to remain simple and stay small, going for zero growth. He's no plans for glossy adverts, or catalogues - word of mouth seems to suits his needs. So I asked what he would do if tomorrow he got a call asking for 1000 sleeping bags. "I'd say something that is very hard to say in business, and took me thirty years of hard work to discover. I'd say no." Copyright Andy Kirkpatrick. This article first appeared in Climber magazine. 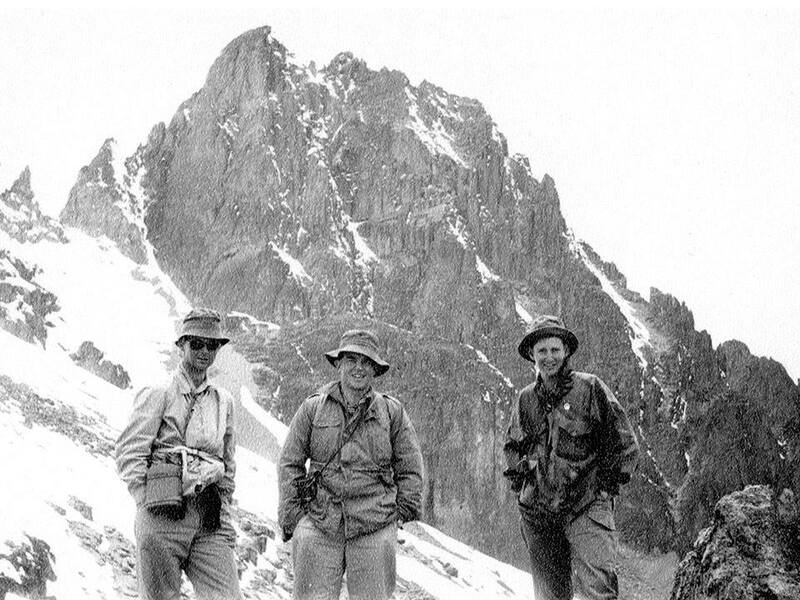 Our founder Peter Hutchinson (on the right) climbing Mt Kenya in 1956.